You are here: Home / Lifestyle / Batter Up! If you’re busy during the week, leftover stovetop oatmeal does re-heat well and is still way better in texture than microwave oats. The only secret is to rehydrate it with a little milk before heating. But another idea: blend it up! Two summers ago when I was in summer school classes from 8 AM to 9 PM daily with just a 3 hour break, I didn’t have time to exercise AND make breakfast in the mornings. So I’d make a big pot of oatmeal on Sunday and do creative things with it during the week. One of my favorites was to put cooked oatmeal into a smoothie! Example here! LOVED the texture. You could probably bake something fun with this! It was good – nice spice – but I don’t like sweet coffee and of course I didn’t realize the jam would sweeten it! D’oh! Still good though. How Do You Eat Your Great Harvest? Check out my guest post on the GH blog!! 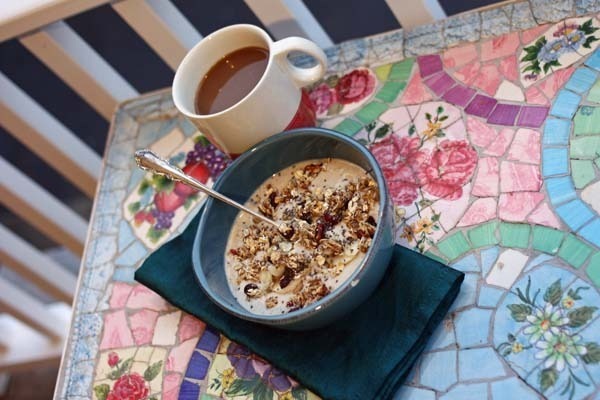 Do you eat that oat batter hot or cold? I’ve definitely never blended cooked oats! But it does sound kinda good. I’ve been known to blend canned pumpkin with milk and spices (and I like a little bit of sweet with stevia!) and then mix it into my coffee. 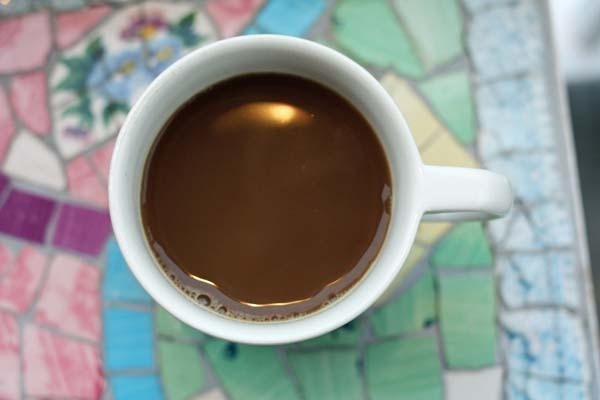 Super yummy – sort of like a pumpkin latte! Oooooh, I bet that would taste delicious!! 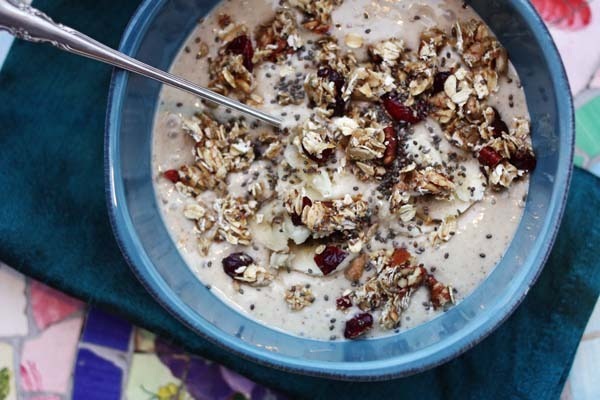 Omg I never even thought of blending cooked oats! Amazing idea. 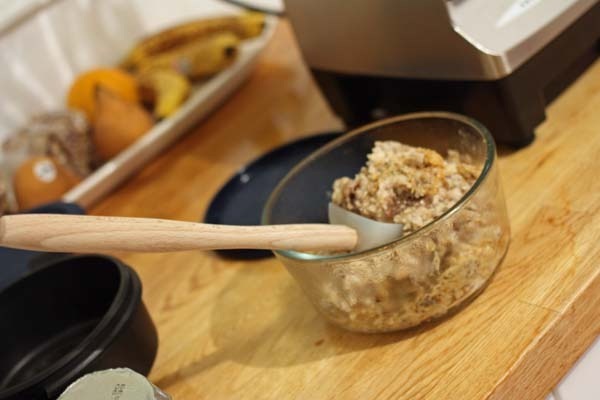 I always cook up a large pot of oats for the week since I’m usually out the door by 8am so I will definitely be trying this (once I get a working blender…) My roommates will most likely not be happy to wake up to the whir of me blending up an amazing breakfast! I just finished a book that I think you should check out. One of the inspirations was Kanzi and it made me immediately think of you and Matt. It’s called Ape House by Sara Gruen who also wrote Water for Elephants. Oh fun – taking note! I loved Water for Elephants! Need to check this new book out! What an interesting idea. I just had re heated oats this morning. You way sounds pretty good. I have been trying to make your oatmeal for weeks now and it’s been a fail every time (I CANNOT cook at all) and finally did it successfully this morning, peanut butter on top and all! It was awesome! Also I have worked right across the parking lot from a GREAT HARVEST for a couple of months but haven’t had the courage to go get a loaf of bread from there. (It smells amazing and every time I walk by I want one SO bad but carbs have scared me, but I’m getting a lot better thanks to you and Caitlin) And so on Friday I went in and got a loaf of Dakota- IT IS SO GOOD! I think my fear of bread is finally being tackled! Dakota is the best carb in the city! 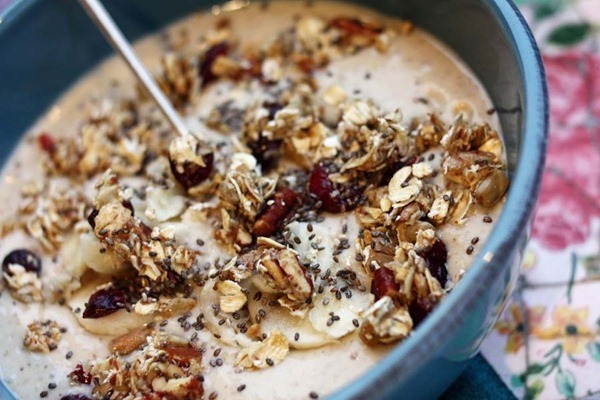 I love oats any way you can cook them…this looks great! Enjoy yoga! This is such a great idea…great for rushed mornings!! Ooo I’m curious to try that and see how it tastes myself! Teehee, I, too, am not usually into sugar in my coffee, so what a shame about your sweetened PSL! Perhaps you could try with straight pumpkin puree next time? I’ve never blended cooked oats — I sometimes add a 1/4-1/2 cup of raw oats to smoothies if I am out of bananas — it gives them a nice texture. That mosaic table is perfect for tea time, something I wish I had when I was 6 years old (but would totally take as a 24 yr old!) How nice of Allie to bring some bars with her when she visited! i would never have thought to blend my oats! making oats ahead of time is definitely a good time saver, i should start doing that for the work week! I made overnight oats for the first time last night. This morning, didn’t like so much, Eeek. I mixed 1/2 cup rolled oats, 1/3 cup 1% milk, 1/3 cup greek 2% yogurt, 1/4 cup pumpkin. Topped with heavy tsp of almond butter this morning. Is my mix just not a good combo? Your’s always look so yummy! Maybe I need some sweet-ness to it? Maybe some jam? Or a vanilla yogurt? I want to try to blend some oats. Last night, I made steel cut oats on the crockpot for the week. It would help to have them in smoothie form on days that I have class early. Thanks for the tip! I love that pumpkin butter! I brought a peanut butter & pumpkin butter sandwich for lunch today. Yum! Fun about the new novel, Ape House by Sarah Gruen. 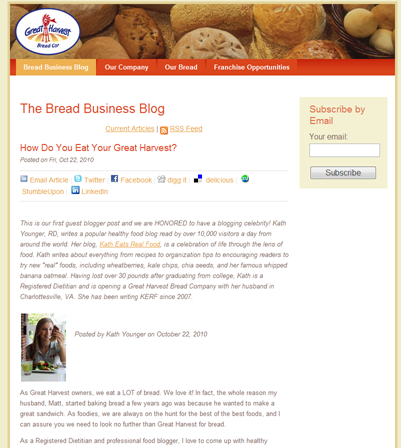 Love the Great Harvest blog post! You always find ways to bring the word “smoothie” to a whole new level. I can’t tell you enough how much I love your blog! I am a post-gastric bypass lady, and your ideas are so perfect and tasty. Not to mention your house is absolutely adorable! I just learned that there is a Great Harvest in Alexandria – not too far from me. I cannot wait to stop by and try some of the breads I read about here!! Just like my disdain for bananas..hope we can still be friends …. blended oats?? man it looks good but i dont know…. but you are the oatmeal queen so i should probably just go for it. Blended oats sounds fun to eat! 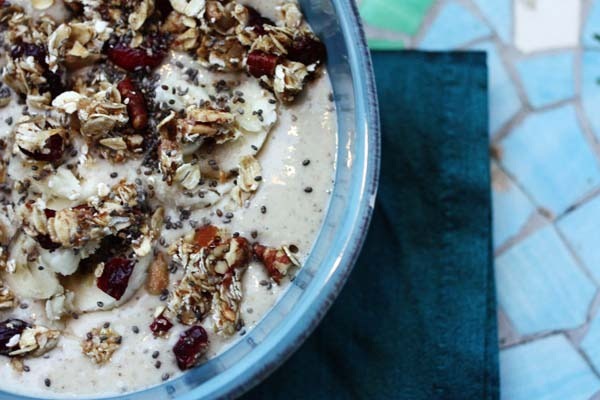 Oatmeal in the blender – brilliant! It looks like a breakfast soup! I could totally get into that. Have a blast a yoga – its the best way to kick off the week! Oat batter sounds pretty genius! Do you think it would blend well with coconut butter? i spend soooooooo much time making stovetop oats pretty much every morning while runnning out to work… this would be very very helpful. going to try! Oat batter is awesome 🙂 I love blending oats, specially making green oats with spinach! whoa…total yumminess in a bowl! Fabulous idea to blend oatmeal. NEVER would have thought of that. So is it just the oatmeal that’s blended and then you STIR in the yogurt and banana? No, it was ALL blended. YUMMY!!!!! I am having your version of Pumpkin oats with peanut butter and sunflower seeds 🙂 Delish!!!!!! I just read the GH post and was wondering if you ever posted the recipe for the stuffing y’all did last year for thanksgiving. If so can you tell us where or provide a link? I don’t have one 🙁 I think Matt invented it on the spot and we never posted the recipe. This year we’ll be doing something similar and I will take notes! For a while I was making a huge batch of oats every weekend to last through the week, but now I’ve been putting dry oats with some water in a container overnight and that works pretty well 🙂 I think I’ll give my steel cut oats a whirl for the rest of the week, thanks for the motivation! Ack! That sounds amazing; I need to make this immediately! That sounds REALLY good! I’m all over anything that’s like batter!! sometimes the things you have on your blog seem like they are too-good-to-be-true…i mean, who would think that blending oats would be tasty? naturally, my brain went to “ewww!”. I love the idea of oat batter!! That sounds awesome. I am still in the overnight oats phase right now. I exercise 3x a week in the morning (Monday, Wednesday, Friday), so the other two days I have enough time for hot oats on the stove! oh, vitamix. what can’t you do?! I WANT ONE!!! Oatmeal Batter?!?! Sounds yummY! Thanks for the great weekday breakfast tips! I’m going to start working out in the mornings so I will definitley try making oats on Sunday to eat during the week!!! You weren’t supposed to open the card until tomorrow! I can’t wait to try the oatmeal batter, I love finding new creative ways to eat my oatmeal. Speaking of Great Harvest bread, I made a point to stop there over the weekend. I have to admit I think I have eaten half of the pumpkin streusel bread myself. mmmm Yum! Oat batter sounds and looks amazing! Must have this soon! You tease 🙁 I don’t eat Great Harvest because there isn’t a bakery in NYC! Wassupwiththat?? So I stare at your pics and dream about eating it instead! It looks delicious enough to eat without toppings, though, so I would do that! I was thinking if you want a PSL sort of taste without the sweetness (I don’t like sweet coffee either), you could sprinkle pumpkin pie spice (like McCormick’s or whatever) on top of the coffee grounds before brewing. I have done that before with cinnamon and nutmeg. If you click on one of the links in this post (I think the first one to the smoothie) I gave a tentative workout schedule. It made it happen! I skipped some days and had to do shorter workouts than usual, but I manged to keep up a good routine. 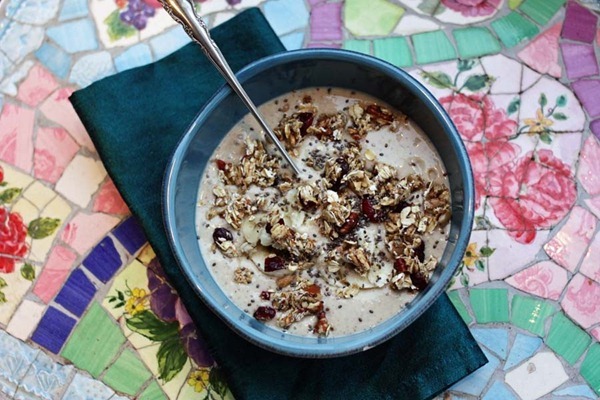 Love your ideas for oats! I’m a steel cut fan and make ahead on Sunday as well. It’s so fast on weekday mornings and I can eat in the car on my drive to work – multi tasking is a necessity! I’ll be trying a spoonful of different butters ASAP. Thanks for sharing your beautiful food pictures too! Oatmeal is not a “beautiful” subject, but somehow you make it mouthwatering! What kind of camera do you have? I’m looking for new one and love the quality of your close-ups! Ok, Wow, you are very creative. Definitely trying this out this weekend. Thank you! P.S. 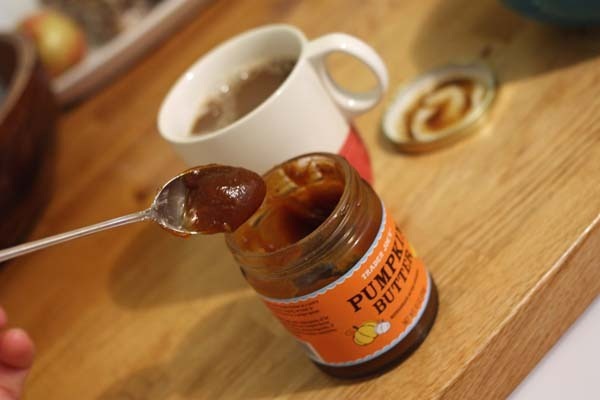 Pumpkin butter in coffee?? GENIUS! Does blending the cooked oatmeal change the gi? Wouldn’t this be just like having instant oatmeal?